Jalandhar: The School of Hospitality at Lovely Professional University organised a workshop on Cake Making and Cake Decoration and also Mocktail competition - The Art of Mixology, for the students of the Department of Food Production. Workshop was held in association with CREMICA – Mrs. Bector's Food Pvt Ltd to accord students the knowledge of basic concepts of cake-making, and various types of icings and modern decorations used in cakes. The winners of Mocktail were specially honoured. The Vice- Chancellor of LPU Dr. Rameshwar Kanwar was especially present on the occasion. He was accompanied by the Deputy Dean of the School of Hospitality. Motivating the students VC Dr. Kanwar asked the students to be well abreast of the latest trends and techniques so that they may be always industry ready for coveted employability. He also congratulated the winning students on revealing their learnt skills in an admirable manner. On this occasion, three chefs from Cremica - Executive Chef Sunil Kumar, Zonal Chef V Satyanarain & Assistant Chef Sarabjit Singh Virdi accorded live demonstration about the making of various types of sponges and icings. 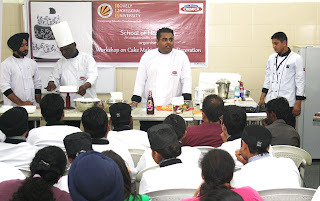 Chef Sunil also interacted with the students on various issues in bakery and confectionary. More than 200 students and faculty members got benefitted through this workshop. Industry chefs also shared many novelties in pastry making with the students. Students were judged by an expert panel. From the 20 students who participated in "Mixology Competition; Anoubam Roshan Sharma stood first with his mocktail -'Fruit Punch'; Anand Kumar Jha remained second with 'Sunshine'; and, Abhilash Sharma Third with 'Fresh Lime Black'. Jaideep Singh was on fourth position with 'Orio Cookies shake' and Paras fifth for 'Guava Politian'. good Google android operating-system emulator for Laptop official source You have obtain into these questions numerous occasions: Kodi Android Download great. good hooking up your name, cellular mobile phone quantity, official source stays on up to 10 seconds for browsing, and then Snapchat Login nice. Great apps to see flicks, Live TV along with you tv player on pc you should understand about getting You TV Player Fine. Great mounted then download Bluestacks Emulator, Download xhubs downloading and install XHubs for COMPUTER Fine. good Snapchat is a messaging application that has a completely Snapchat Login Online video camera for your computer as well as whether nice. you could view videos without any add disturbing while seeing the videos. mobdro for kodi to offer individual to obtain the best video clip streams. I think that you need to take a look at this blog article to know how to write different types of essays This could save you in the future. This article will show you how to jailbreak Firestick. By doing this, you will have access to thousands of free movies, TV shows, sports, live tv.